Hi girls!! I am going to review this new lip butter in my vanity today. This is Skin Café Key Lime Pie Lip Butter. Skin café is a new brand that makes handcrafted natural lip products like lip scrubs, lip butter and lip I have tints. Their products are made from natural products and are delicious smelling. I have many lip balms but getting a new one still excites me especially when that comes in a cutesy pot packaging like this. 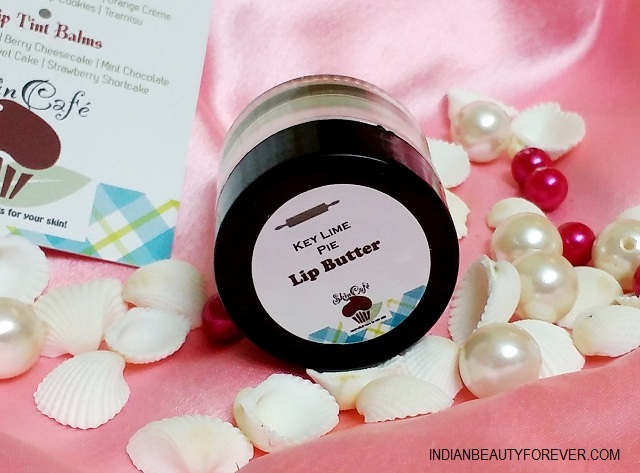 Let’s know how this Skin Café Key Lime Pie Lip Butter fared for me. 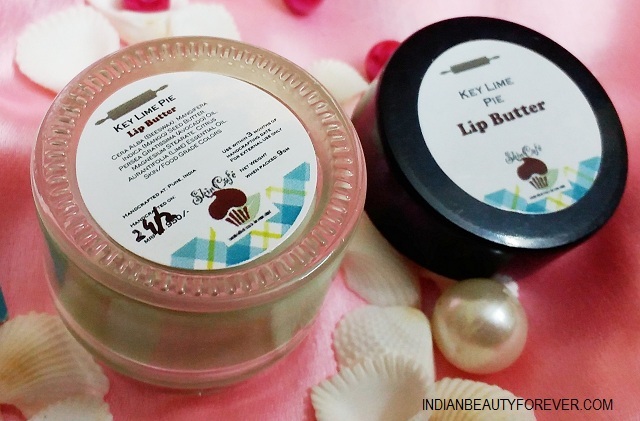 Price: Skin Café Key Lime Pie Lip Butter is priced at 950 rupees for 9g. 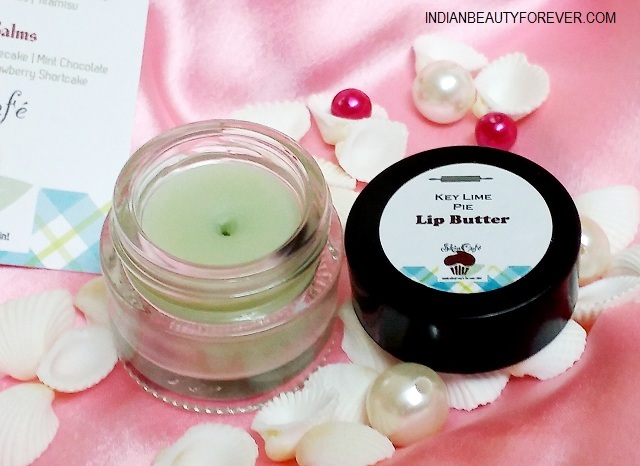 Skin Café Key Lime Pie Lip Butter comes in a very heavy glass tiny jar with a black lid. I like the packaging, that can’t get any cuter. The mint greenish lip butter is so pretty looking. But I still can’t ignore the fact that every time I will use the product, this gets into my finger nail.. eww. But anyways. This smells citrusy and spicy at the same time to me. This lip butter is loaded with essential oils like Avocado essential oils and lime essential oils. These essential oils keep the lips soft and heals them. This also has mango seed butter which further softens the lips and treats the dryness. I love the creamy smooth texture which is a treat to use on the lips. I use this at night mostly when all I need is the moisturization and no color or tint. My husband also uses this and likes this a lot. The lip butter is purely organic therefore everyone can use this even for your little ones. The balm is needed in little amount and gives immense moisturization which is great. Tub packaging looks quite but err you have to dig your finger in. Skin Café Key Lime Pie Lip Butter is a very healing and hydrating lip butter that keeps the lips moisturized and soft. You should definitely try this if price is not a problem for you and you like citrusy spicy scent in you lip butters. Packing is cute but it is so expensive. I love the packaging! It's so cute! Oh my gosh....how cute is that packaging? 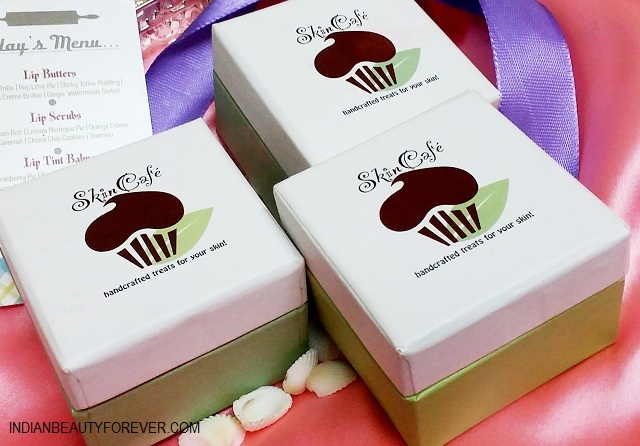 The cup cake style box packaging is amazing. It sure is expensive.